You are here: Home / Topics / Get On-Time / “Bunt” Your Way To Repeatable Power? 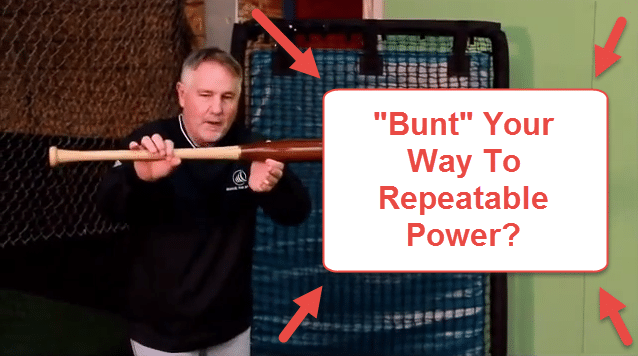 “Bunt” Your Way To Repeatable Power? Interesting how he compares the impact positions of bunting to the swing. Is he promoting a straight arms at swing impact? Bat speed is not enough, and a hitter needs to couple that bat speed with controlled forward movement. https://hittingperformancelab.com/wp-content/uploads/2018/05/hitting-performance-labs_c90c0362088ef1d3d528f3078f4f8ac1.png 0 0 Joey Myers https://hittingperformancelab.com/wp-content/uploads/2018/05/hitting-performance-labs_c90c0362088ef1d3d528f3078f4f8ac1.png Joey Myers2015-05-06 03:49:462018-05-17 18:03:50"Bunt" Your Way To Repeatable Power? I like to refer to his linear forward motion into rotation as ‘weight shift’ or forward weight transfer. All the great hitters do this. Babe Ruth made this technique famous and apparently he learned it from Shoeless Joe Jackson. None of them ‘squished the bug’…consequently keeping their weight trapped on their back leg. So many great hitters (Gehrig, Mantle, Williams etc. etc. etc) used forward weight shift over the years…why was it ever lost and why does it now need to be rediscovered? If adding base speed into the swing speed were the case then why do utube MLB slo mo vids show a head that is not moving and a knee whip that is stabilizing the whole front side? Bravo Blake!! And is why I was never good at push bunting because I had “base speed” moving into the ball. The bunter will get the “push bunt” result just by impacting the ball with straight arms, no forward movement. In regards to the swing, I agree. Linear momentum is being converted into angular during the Final Turn. There shouldn’t be anymore “base speed”, as you call it, going into the ball then.